My recent foray into ravioli got me making and roasting beets for the ravioli filling and has inspired me to make vegan beet hummus again, something I love to eat but haven’t made in a while (as I overdosed on it some time ago and needed time off). 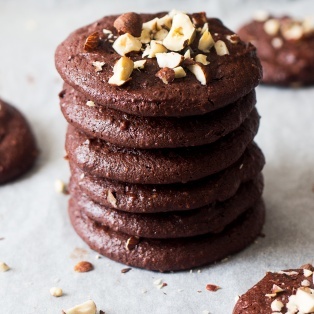 Another ‘magic’ ingredient is aquafaba or simply the water the chickpeas have been cooked in, preferably fridge cold, trickled in slowly as the blender is grappling with the remaining ingredients. That is it, ladies and gentlemen. 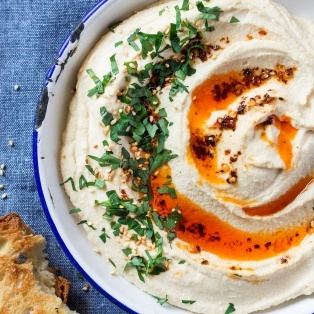 These two simple tricks will give you a smooth hummus experience you’ll get addicted to 😉 . PS: If you make beet hummus my way, don’t forget to tag me on Instagram (tag me as @lazycatkitchen and use the #lazycatkitchen hashtag). I love seeing your takes on my recipes! To cook your beetroots, you could bake, steam or boil them. I baked mine. To bake your beetroots, heat up the oven to 200° C / 390° F. Place washed beetroots in the middle of a large piece of kitchen foil. Holding the edges of the foil up with one hand, drizzle a bit of water to the bottom of the parcel so that the beetroots cook in their own steam. Scrunch the edges of the foil above the beetroots to create a parcel. Bake until you can easily pierce each beetroot with a knife (about 60 min, depending on the beetroot’s size). Once the beetroots are cool enough to handle, peel the skin off. 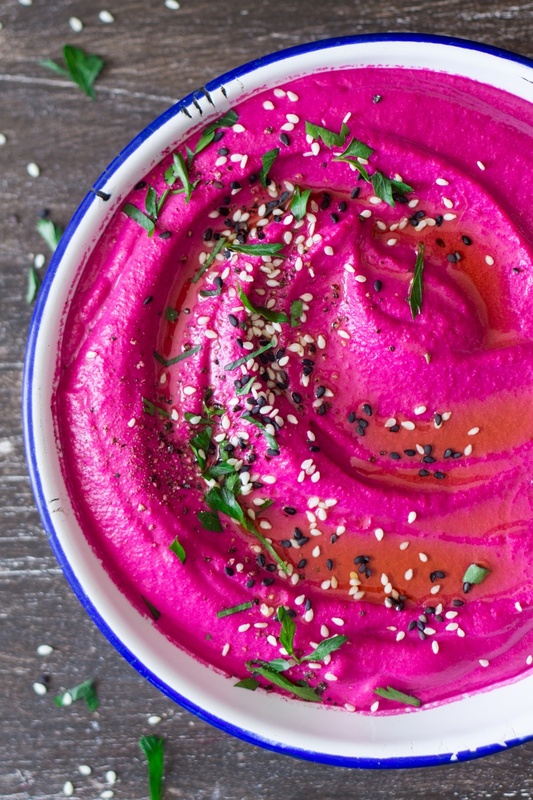 Pour cold aquafaba and lemon juice to the bottom of the blender (or a food processor, but blender will give you a smoother hummus) with all the tahini, roughly sliced beetroots and chickpeas. Process until smooth. If the mixture is a bit too thick, trickle more aquafaba (or cold water) through the opening in the lid. Once the mixture becomes homogeneous and thick and your average blender starts to struggle (if you have a Vitamix or a similar hi-tech blender you probably will not need to worry about this) start making circles on the surface of your hummus mixture (in the direction of the turning blades) with a spatula (don’t dip the spatula in too deep as you don’t want to accidentally touch the turning blades). This simple action will prevent air pockets forming under the mixture’s surface, helping your blender process the heavy mixture. Finally, season the mixture with salt, cumin, garlic and extra lemon juice if you like. To serve, put hummus in a bowl. Drizzle with extra virgin olive oil (if you don’t care about it being oil-free), sprinkle some sesame seeds and chopped parsley on top. 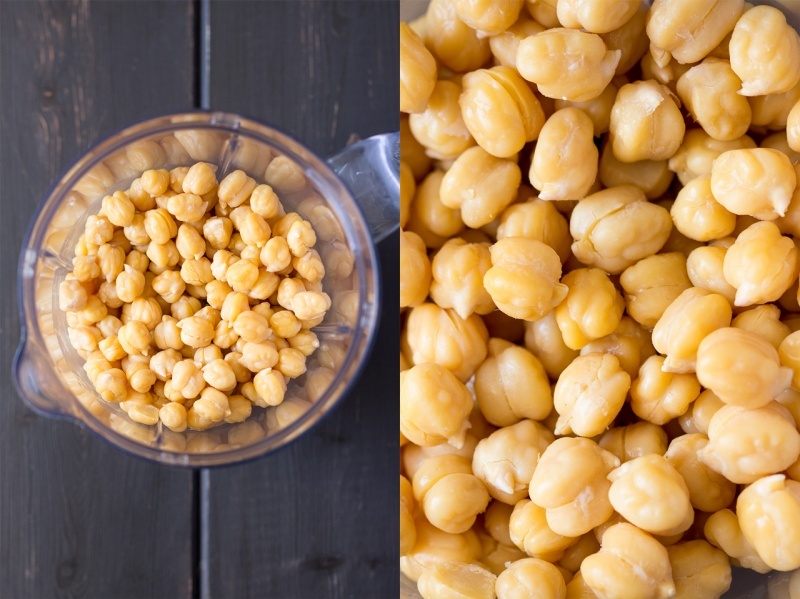 *aquafaba is a fancy name for chickpea cooking water. In this recipe, it works best if it has been cooled and chilled in the fridge. This hummus is beautiful! 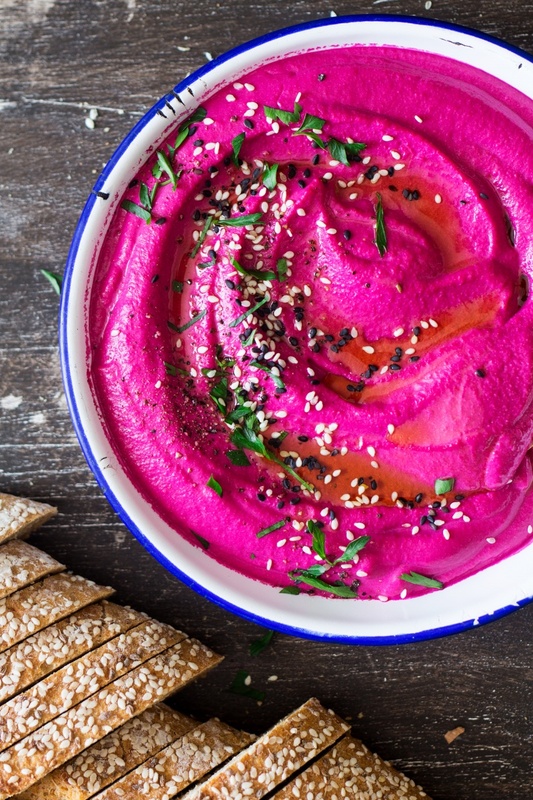 I’ve made beet hummus a few times but it’s been quite a while so I definitely want to try this recipe out soon! Thank you for the feedback! As head of the eating department, I can vouch that you won’t be disappointed! Beautiful and tasty. I was just wondering what to do with all the extra beets I have in the garden. Thanks for the perfect solution (and the blending tips)! Wow really delicious! I republished the recipe on my blog with a link back to the source on your site. Thanks for sharing, such a wonderful color! If I don’t want to make aquafaba, can I use egg whites instead? If so, any idea how much should be used? My Easter Sunday lunch looked so bright and colorful. 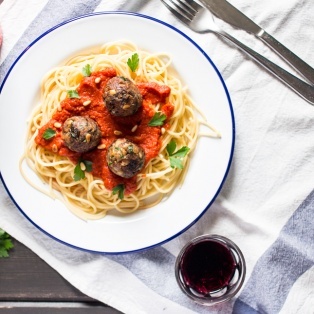 Thank you for such an easy peasy fuss free Recipe.Absolutely loved it. We had it with some toasted bread. The only thing I did differently was that I steamed the beets instead on baking them. I’m really glad that you enjoyed this recipe! 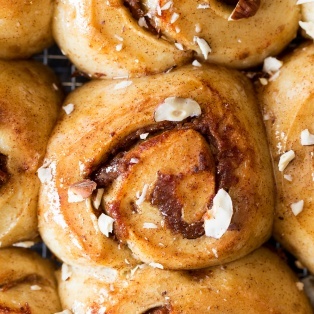 This is personally one of our favourites and something that we eat all the time at home! Great recipe, very tasty dip plus it looks pretty, too. It does take a long time to make (especially pealing of the chickpeas, took me ages:)) so I’m happy there is a lot of it and I will freeze some for later. I used a bit more lemon juice (I love lemons) and toasted the sesame seeds that go on top. Thank you! gorgeous! best hummus I ever made. And so much of it, yumm. Thanks you guys! Looks amazing! Does it freeze well too? Thanks. Thanks, I’m going to try it today. Will freeze a small portion and let you know :). 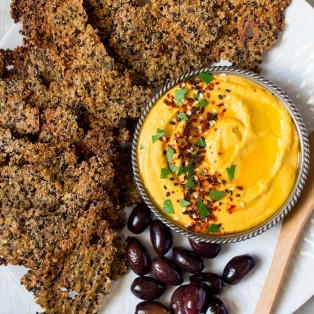 I love hummus, but this color is just amazing I will definitely try to cook this recipe. Thank you for sharing this delight with us. A beautiful recipe. I garnished with finely chopped mint and, as in not vegan, crumbled feta. A family favourite! 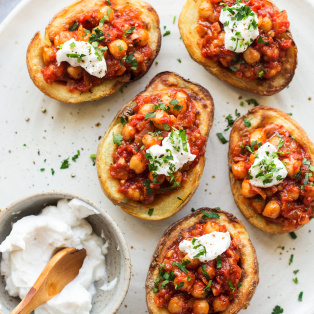 I would love to try this recipe but as I live alone I was wondering if it stores well in the fridge and if it does for how long? I’m afraid I won’t be able to eat everything at once:) thank you for sharing such a colourful recipe! Do what I do invité friends and neighbours in for drinks and nibbles. 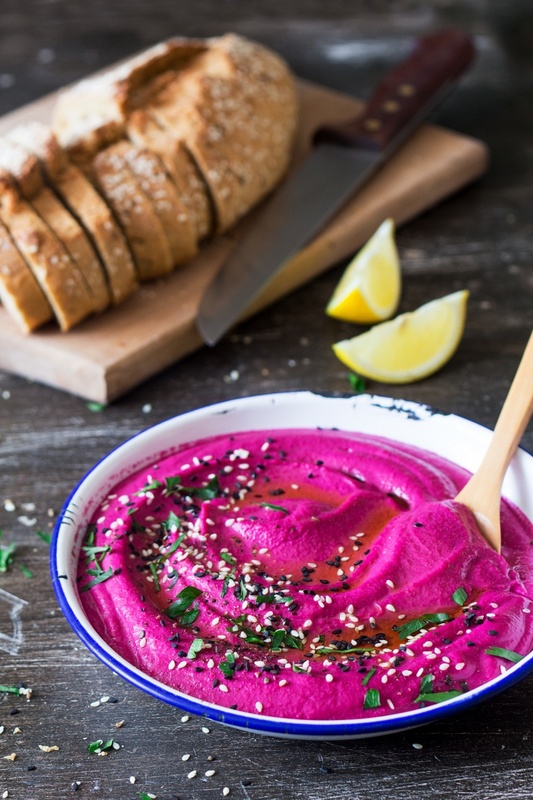 Love the simple but delicious twist beets give to hummus! Yum. Thanks for sharing 🙂 PS. gorgeous pics. Just made this delicious hummus. I love it. I will make it for sure again. I really like you guys. I just yesterday came across your blog looking for a beetroot hummus recipe. I am seeing a lot of yummy recipes that I will try out. I am only vegan since 3 months…. thank you for plowing the way for me.